The one that you want is back! GREASE, Time Magazine’s 2007 pick for “#1 musical of the year,” is rockin’ across the country in this new production direct from Broadway. Kathleen Marshall directed and choreographed a cast that includes Eric Schneider, Lauren Ashley Zakrin, Taylor Hicks, Scot P. Alan, Will Blum, Bridie Carrol, Kate Morgan Chadwick, Brian Crum, Kelly Felthous, Dominic V. Fortuna, Erin Henry, Roxie Lucas, David Ruffin, Allie Schulze and Nick Verina. You can't expect much from Grease except 1950s flavor and chipper tunes. The production at the Kravis Center gives a pallid imitation of both, and sometimes even rises to the level of entertainment. Eric Schneider and Lauren Ashley Zakrin as the romantic leads Danny and Sandy fill the stock roles of bad boy and virginal girl adequately. Zakrin has a powerhouse voice she unleashes most effectively in Hopelessly Devoted to You when her high notes send chills up listeners' spines. Marshall's stage-movement choreography is lively, but there isn't much daredevil dancing, which is a pity, considering there's a big dance contest scene in the show. 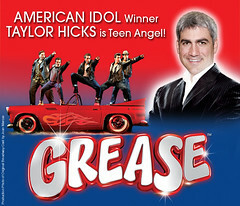 Grease plays at the Kravis Center for the Performing Arts through Sunday, November 15, 2009.